Nearly two months after devastating blizzards hit parts of South Dakota and Wyoming, farmers are still recovering from the loss of cattle and the effect on their businesses. The week before the storm, it had been wet and mild and the prairies of the Great Plains were deep in mud. Then, the first winter snow came early and unexpectedly in an icy blast from the north-west. Trapped in the mud, 30,000 cattle suffocated and froze to death. They were buried in 20ft (6m) snow drifts, entombed in ice in what ranchers call the "breaks and draws" - the slopes and valleys - of the rolling prairie hills. Larry Stomprud is a tall, thin cowboy wearing a black leather waistcoat and slim-cut blue jeans. Grey hair peeps from beneath his brown cowboy hat. 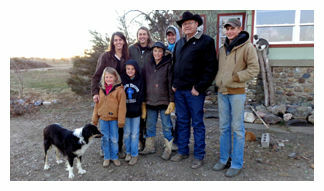 He is a tough rancher who has spent half a century herding cattle. But his voice falters and there are tears in his eyes as he describes the devastation on his ranch. "I looked at my grandfather's records," he says quietly. "It was the worst storm for 150 years." His throat is strangled with anguish and with sadness as he says: "God entrusted us with the care of these animals and we failed them." Larry Stomprud and his family. At Lone Tree Ranch, in Meade County, 3,000ft (910m) up in the undulating hills that stretch out over the prairie like giant sand dunes, Larry Reinhold shows me Costello Point where nearly a hundred of his horses perished. In cash terms his losses will run to around $250,000 (£153,000). "It is not the money," he says. "These animals were our friends. It is heartbreaking." 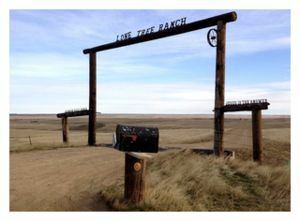 Larry runs ranch holidays for children from all over America and his business is now in jeopardy. 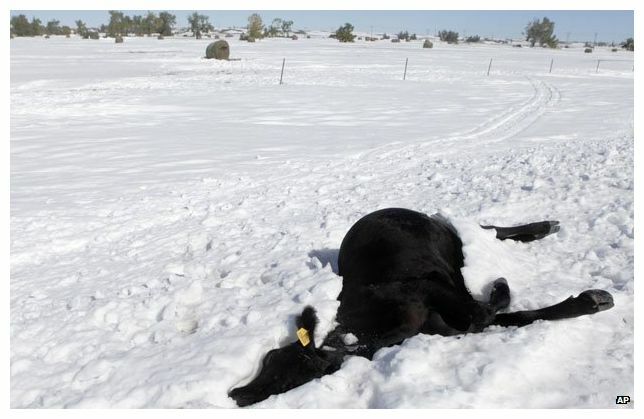 In the community of Box Elder, Monty and Bobby Jo Williams lost 200 Angus beef cattle but they did find one small calf buried in the snow and still alive 17 days after the storm. "We have to trust that things will be OK," says Larry, holding his two-year-old daughter. "Our little girl has kept us going. We have to think of the future." The situation has been made worse for South Dakota's ranchers, because the blizzard hit while politicians in Washington were doing their own wrangling over budgets in the US government shutdown. In a state guarded by the rocky faces of the four great American presidents carved into Mount Rushmore, the farmers have no government aid package and no hope of help until Congress agrees on a new US Farm Bill - which is not expected any time soon. 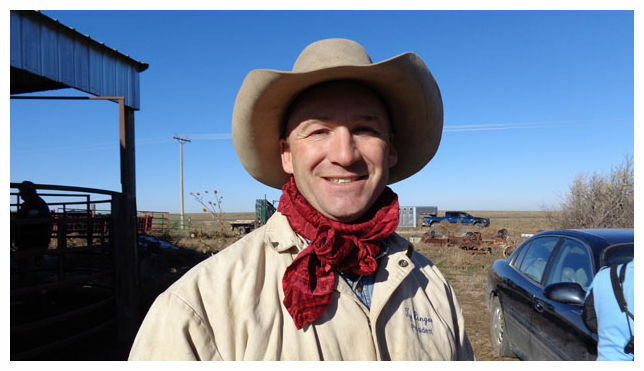 But ranch folk help each other and in an inspiring act of charity, Ty Linger, a young Christian rancher from Montana, has created Heifers For South Dakota - a sort of Cattle Aid for farmers who have lost livestock. "My inspiration is Galatians 6:10," he beams, saluting me with his cowboy hat and wearing a jaunty red silk scarf tied at his neck. 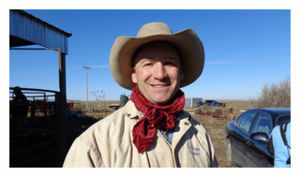 Those lines from the Bible say if you have the chance, do some good - and Ty's leap of faith has seen farmers from neighbouring states donate 650 cattle to ranchers in need. We meet in a yard teeming with tons of prime beef. Cowboys and cowgirls are herding the animals on to waiting trucks as the recipient farmers shake the donors' hands with tearful gratitude. "I thought if I got just one cow it would help someone," shouts Ty standing on the wooden rails of the corral. "But they just keep coming," he laughs. On Sunday, the white clapperboard Foothills Community Church gleams in the bright winter sunshine under a big, blue prairie sky as families arrive in pick-up trucks for the morning service. 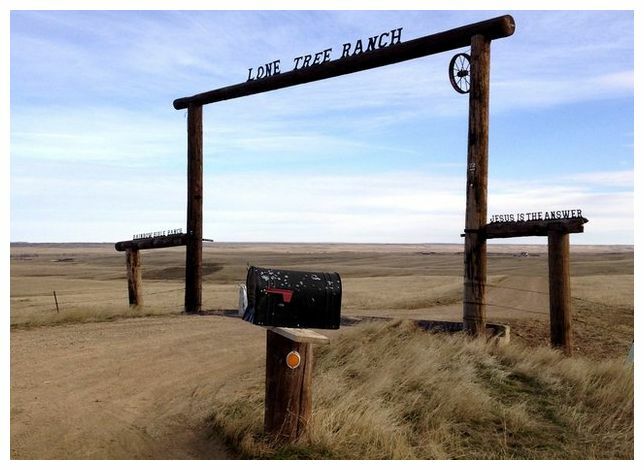 Lone Tree Ranch entrance in the Great Plains. It is the Sunday before Thanksgiving and the pastor Brian Carpenter - a huge, bearded man in a grey T-shirt and slacks - welcomes me with a hug and invites me for lunch. "Smoked beef brisket. You won't get that back in Britain," says Brian. He talks of his fondness for the BBC - he listens on the internet - as he strides around his cosy little church, taking his place at the lectern. Ty Linger from Heifers For South Dakota is invited up to the front and there are quiet tears as he is presented with a donation from the Foothills Church. The congregation sings Count Your Blessings, and Brian's sermon has a Thanksgiving theme. "Be thankful in all circumstances, even when times are tough," he urges. Outside he shakes my hand, saying quietly that South Dakota's ranchers have God to thank for their survival after the storm - not the government.